Ultrasound is a safe and widely used imaging technique. Ultrasound produces detailed pictures of the body in real time using high frequency sound waves which are produced by a special ultrasound probe, called a transducer. The frequency of these sound waves is higher than that detected by the human ear and when they are reflected by a part of the body they are detected by the probe and used to create images that can be displayed on a monitor. Because they are captured in real time they appear as moving images not as static or still ones thus enhancing the diagnostic capability of the test. 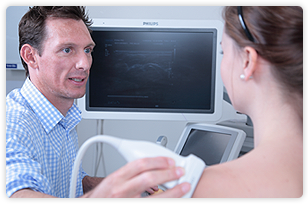 Ultrasound has no known harmful effects and can be used to image a variety of conditions including pregnancy, gallstones and varicose veins. 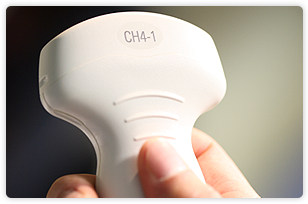 Ultrasound can also be used to measure blood flow through vessels, when it is called a colour flow Doppler or Duplex scan.